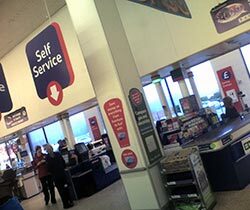 I wish to gripe about the Self Service checkout tills that have been springing up everywhere including my local branch of Tesco. It is so disgustingly obvious that these things have been put there to save the company employing checkout staff. I would imagine one of these machines will pay for itself within two years. These machines are definitely not there for the convenience of Tesco customers, that's for sure. It takes twice as long to unload, scan, and pack your own shopping as it would for an assistant to do it for you. I work in I.T. myself, I love computers and machines, but even I recognise the value of simple human contact in retail environments. There is a lot to be said for a simple "hello" or "thank you" from a checkout assistant at the supermarket. Not to mention the much nicer feeling of handing your money to a human being instead of a machine. So many aspects of life are already impersonal enough as it is without a soulless shopping experience as well. Unmanned checkouts - a cynical attempt to force customers to use the self service tills? What really winds me up, though, is when you go into Tesco at certain times of day, and of 10 "manned" checkouts, only one of them is actually "manned", the rest are left unattended, presumably in a cynical attempt to force customers to use the self service tills. Don't get me wrong. I'm not an "anti-Tesco" person by any means. I like the shop. I just find these self service checkouts smack of laziness and penny pinching on the part of Tesco, and I find their very existence a bit of an insult. The joke is, at busy times Tesco have to employ a member of staff to attend the "self service" checkouts. They're there to assist all the poor shoppers who get befuddled trying to use these machines, and all of these shoppers are noticeably annoyed and angry at having to use them in the first place! If anything I'd say I'a Tesco fan, but I don't see one single redeeming feature in these "do it yourself" checkouts. Come on Tesco - surely you can afford to ditch them and go back to good old fashioned "members of staff"? Your customers would really appreciate it. Today at my Exeter city centre Tesco store I only received 86pence of my 90pence due. I asked a member of staff...rare in itself, why? It seems they do not hold 50 or 10pence pieces, so unable to dispense all my change. So....how often is this happening ? Maybe if they gave users a discount, say 10% off for using self service tills I MIGHT be slightly more inclined to use them and I actually understand the logic flow behind them. well, ALDI is worse coz their poor staff keep scanning items like robots and all you hear is beep beep beep beep....at a rate faster than TESCO/Sainsburys. I'd rather use self service machines than seeing these people suffer from a job they don't enjoy. I have been trying to e mail Tesco complaints, but it seems they don't like listening to their customers, only taking their money. Great Yarmouth Extra's store is now forcing people onto these self service machines by closing the tills. Tesco's policy is to make more of their staff redundant nation wide to satisfy corporate greed. I'm now going to Aldi to give them a try. I went to buy my lunch from tesco express. I told the machine I'd brought my own bag so it asked me to put it in bagging area. Ok you're the boss mr self service... so I put my bag in the bagging area. I don't think it quite expected the bag to contain enough cermanic tiles to tile a metre square. That was my previous purchase. I.e quite heavy. After I paid it found an unexpected item in the bagging area. I took my shopping and it seemed to shutup. Maybe the scales will need a little calibration. ..
I`ve tried using these things, & they never seem to work & I end having to get assistance from one of the staff. I don`t like these things at all. Why do the Self Checkout machines at Tesco in Truro (England) only accept Bank of England notes but Tesco Stores in Inverness and Aberdeen (Scotland) accept both English and Scottish banknotes??? They appear to be the same equipment so why not the same banknote recognition software??? The self service machines are poorly designed. I paid for a £6:00 item with £10.00. Three of the one pound coins were in the collection scoop and one bounced out to who knows where. Thank you! I am unemployed and am looked at with distaste when refusing to use the self service machines, by the very people whose jobs I am attempting to guard. I work on the Morrison's self scan area. 99% of the problems that arise are because the customers don't READ or LISTEN or WATCH to what they are supposed to do (It tells you and shows you on screen people!) They are only meant for a couple of items anyway, so that you don't need to wait behind a huge trolley but people just don't get that and try to scan like 20 items through. I'm sick of hearing 'they take away jobs' They don't just magically appear! Get rid of them you say! So what about the people making them and creating the software, what about their jobs? Or does that not matter as long as you get your ten items scanned for you? Besides, if they weren't there they wouldn't hire more staff, we'd just have bigger queues. Supermarkets are a business, they are there to make money and that is one way of doing it without having to raise prices to unaffordable levels. And if I hear another person say 'oh, I should get a 5% discount for doing YOUR job" I will scream because if you think I make 5% from every customers shopping going through my till then you are a moron. If you don't like them, don't use them. I'm sure Tesco loves these things. Since I'm doing "Self Service" (ooh, err, misses! ), why don't I get a discount? "Self Service" petrol used to cost less than having someone fill the car up for you, and bring you the change. The only purpose of "self service" on Tesco tills is to deprive someone of a job, thus bringing greater rewards to Tesco executives. Well, it doesn't get so much of mine anymore - since over half the tills are "self service" now, I go to Sainsbury's. Still wondering at the sudden loss of market share, you Tesco executive dunderheads? I work for Tescos on self serve tills and enjoy it - the trouble with most gripers is that they do not understand how to do them and as for 'job loss' - how many farm hands lost their job on the introduction of the tractor. Think about that when you queue at a manned till with farm produce. The bagging area is far too small. They have too many blips' - so you frequently need staff to type in a code. Greg, use the bus? To keep bus drivers employed? You must be joking! Bus drivers are high up on the 'psychotic' list, along with psychiatric nurses, primary school teachers and security guards. Dirty seats, illegal smoking, foul-mouthed scallys, litter rolling around the floor, mobile phone conversations blasting in my earhole, mother's with pushchairs and primitive social skills - I'd fight to keep my car any day! Why do you take so long to pack up your shopping?